McKenna Opbroek is spending her summer in a culinary wonderland. Opbroek, a hospitality management and tourism major at Northwestern State University from Keithville, is concluding her summer work as a pastry intern at the Gaylord Opryland Resort and Convention Center in Nashville. The 2,881-room hotel run by Marriott is one of the largest in the world. McKenna Opbroek is spending her summer in a culinary wonderland. 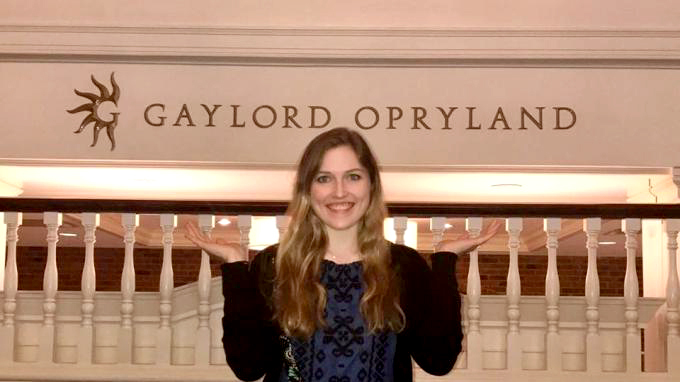 Opbroek, a hospitality management and tourism major at Northwestern State University from Keithville, is concluding her summer work as a pastry intern at the Gaylord Opryland Resort and Convention Center in Nashville. The 2,881-room hotel run by Marriott is one of the largest in the world. Opbroek works on pastries and deserts for banquets meetings and events at the hotel that may range from as few as 15 people to 5,000. Opbroek works with a number of experienced chefs who have been working at the hotel for more than 20 years. Opbroek said working in a professional setting has been a challenge that she has been able to meet. She feels she will be ready to enter the culinary field after graduating next May. Opbroek said the preparation she has received in Northwestern State’s culinary arts program assured she was ready for a challenging internship. For more information on Northwestern State’s hospitality management and tourism degree, go to hmt.nsula.edu/degree-information.